Enter your email below to download the Lake Anna Real Estate Buyers Guide! The 1st Three Tips You Need to Know Before Buying Lake Anna Real Estate! Tip 1: How close can I get my house to the water? The Dominion Line is a set back line around Lake Anna that one must keep their house behind. The line is 5 ft. above normal lake level Basically, if one measures up five ft. vertically and then levels back horizontally to the shore, that is considered the Dominion Line. All parts of the house must be at least 5 ft. from the Dominion Line. This insures that there is no chance of flooding in the house. Spotsylvania County has a setback line called the RPA line that restricts building a house within 100′ of the water. To learn all of the rules and find out how close you can build your house to the shoreline in the other counties, download the Lake Anna Real Estate Buyers Guide. There is a private and public side to Lake Anna and benefits to living on either side. The private side is also referred to as the warm side and can extend the recreation season by several months due to the fact that it can be up to 10 degrees warmer than the cool/public side. 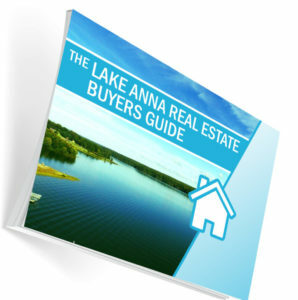 Download the Lake Anna Real Estate Buyers Guide to learn all of the pros & cons! 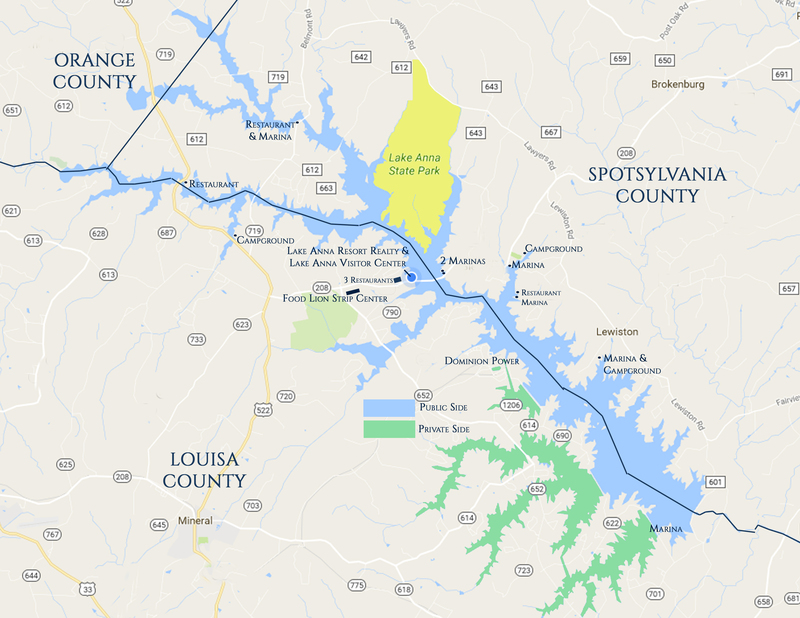 One of the differences in value of Lake Anna property is the North and South end of the lake. The North end of the lake where the tributaries and rivers run into the lake can get muddy and stay muddier longer than the south end where the water is deeper and clearer and more blue. The North end, especially at the rivers, can be very shallow. The property in the North that has shallow water is much more inexpensive than the deeper water in the North and the more expensive South end. There are also some perks to being up north especially if it is close to the Route 522 to Culpeper and Route 29, which leads to the west side of Northern Virginia, Washington, DC, and Maryland. There are many pros and cons to the North vs. the South when considering Lake Anna real estate, so make sure to download the Lake Anna Real Estate Buyers Guide to learn them all. 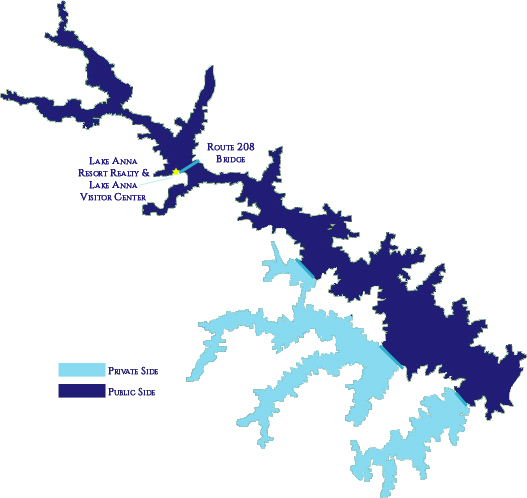 *There are many other factors to consider when purchasing Lake Anna property. Make sure to download the entire 87 page Lake Anna Real Estate Buyers Guide so you can become a Lake Anna expert! Watch this video to understand why you need to download the Lake Anna Real Estate Buyers Guide! Enter your email address to receive the nearly 100-page Lake Anna Real Estate Buyers Guide instantly! Filled with tips and information from Lake Anna professionals, the Lake Anna Real Estate Buyers Guide is a vital tool in your search for Lake Anna property! Watch these beautiful videos of Lake Anna, courtesy of the Lake Anna Visitor Center!